I think it’s a good thing that Apple is taking a step back and not only fixing bugs, but also working to optimize the performance of iOS. There is still untapped potential in the many millions of A-Series processors out there, and making users with older devices happier is a good thing. This is especially true after the battery issues that have plagued many of those same users over the last two years. Also of note is the fact that all devices that supported iOS 11 will also be getting iOS 12. If it delivers the advertised performance, that should make users across the Apple ecosystem happy. It is still early days for AR, and Apple knows it. They have jumped out into an early lead in this category by capitalizing on things that today’s devices can handle well. That practical approach to AR is smart, because if they can get developers centered using iOS for AR work now, they will be in a leading position when real headset hardware is ready to take off. For this year, I like that Apple is making it easier to use AR content formats not just in games, but throughout the OS. Also, multiplayer support was the logical next step for AR in iOS gaming, and it looks solid and stable. This should help to move AR from tech demo slowly toward a usable and even fun experience on iOS. The changes were modest, but I like how Apple has centered all of its recent improvements to the Photos app on using AI and machine learning to help with organization and recommendations. The more Apple pushes these features internally, the more proficient they will become at implementing them. Siri makes both the good and bad lists for me today. On the good side, Suggestions and Shortcuts are smart ways to extend the usefulness of Siri as it stands right now. The service struggles with some areas of voice recognition and with answering questions, but it is actually pretty good at making basic suggestions and associations inside of iOS. These new features amplify that strength, and extend it into what feels like an unexpected direction for Apple. The possibilities that Shortcuts can open up for user and third-party customization are very interesting. Apple is Doing Something Useful With Workflow! Siri Shortcuts shows us that Apple has a plan for Workflow beyond just remaining a stand-alone task automation app. Hopefully we will see the Shortcuts grow into a powerful built-in customization and automation interface. I’m interested to see what it can do paired up with Siri. The Stocks app is one of the originals. It’s been with us since the beginning, but for many of us, Stocks is one of the first apps to get tossed into the Default Apps folder a few screens deep. I know this is the case for me, and to be honest, today likely won’t change that. However, I think Apple was sneaky smart to integrate Apple News into the app, with its focus on “trusted sources” and curated content. The iPhone and iOS are the mobile platform of choice in the American financial community. If Apple can gain traction with News among these wealthy and influential users, it could have a trickle-down affect in other areas. I really didn’t expect to be impressed by the Stocks app coming into today. After years of leading the way in on-device parental controls, Apple needed to play catch-up here. They delivered. The available usage reporting is very detailed, and the new flexible parental controls can be handled right from the parent’s phone through Family Sharing. The new Do Not Disturb and Notification features look like they will be more practical, as well. While Apple didn’t pull even with Google in handling notifications, it did make a solid step forward. The new Grouped Notifications and more granular controls will help with managing larger numbers of notifications and make them more useful. Tongue detection? Memoji? Well, they aren’t for me, but they will be for a lot of people. I do think Apple’s customization options for Memoji keep it from being as cheesy as it could be. Considering the meh reviews, Apple should be able to best Samsung at a feature they tried to stake out with the Galaxy Note 8. As for FaceTime, Apple going from one person at a time to a max of 32 is pretty insane, and potentially very useful. Merging Animoji and Memoji into FaceTime was also a smart move. Is it just me, or is the Apple Watch the center of innovation for Apple these days? 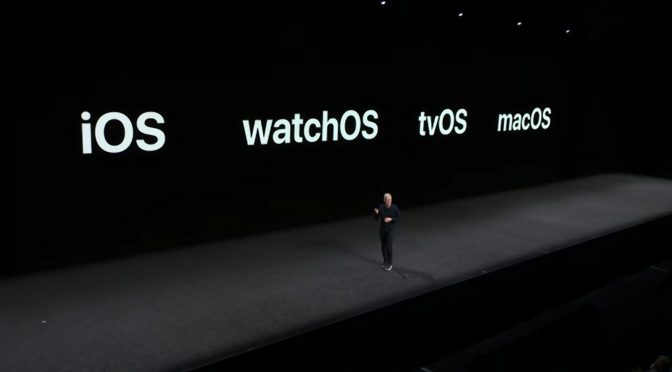 I know there is more room for watchOS to grow, but it is definitely moving ahead fast. The improved interactive notifications, automatic Workout detection, and addition of WebKit to display embedded web content show how the platform is maturing and becoming more of a stand-alone product. The Podcasts app was a timely addition to pair with the Apple Music integration we got last year. Even the Siri Watch Face got access to third party notifications and Shortcuts, making it far more useful. Closing out, the Walkie-Talkie app seems like a smart reboot of the clunky implementation of Voice Messages on the Watch. The Watch is a perfect platform for fast voice messaging. I’m not a Mac user, but I’m jealous of the Dark Mode. It really does look sharp. However, the improvements in Mojave were more than just skin deep. Users got the several new native apps, a Mac App Store refresh, CoreML Improvements, and Phase 1 of the rumored Marzipan, with assurance that devs will get their hands on the the feature next year. We also got an emphatic answer to question of whether macOS and iOS are merging- NO!!! It seemed like a solid confirmation that macOS still has a future, at least for the next decade or so. Nothing on this list stands out as extraordinary, because no single item on it is. However, all of these features are things that either have been needed or are creative and fun, and they will be appreciated by Apple users. Most of all, the speed enhancements and stability improvements that we have been assured are coming with them make the lack of any new true flagship features bearable. It wasn’t a super-exciting WWDC Keynote, but it was still satisfying. I’ll be back later with some of the misses from WWDC. Until then, enjoy the positives, because there was definitely more good news than bad at the WWDC Keynote.